Only 25 examples of the track-only Aston Martin Valkyrie are being built. Expect it to be even more insane than the road car. The F1-inspired Aston Martin Valkyrie promises to be one of the most exciting cars of the decade. The British manufacturer has collaborated with Red Bull to produce a remarkable road and race car hybrid, featuring a 6.5-liter naturally aspirated V12 engine developed by Cosworth and an electric motor powered by an F1-style kinetic energy regeneration system. 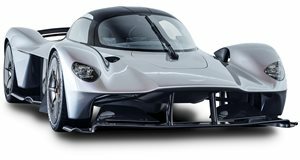 Total output is expected to be 1,130 hp, while the Valkyrie’s curb weight is just 1,030 kg, making it lighter than a Mazda MX-F5 Miata. Aston Martin is only producing 150 road-legal examples of the Valkyrie, along with an even more insane track-only special limited to just 25 examples. Details about the Valkyrie track car are still scarce for now, but sources claim it will look even more aggressive thanks to an extreme aero kit, lower ride height, and a much larger front splitter and rear wing. Aston Martin has high ambitions for the track-only special, as the automaker is reportedly aiming to use it to lap the Silverstone circuit as fast as a modern LMP1 race car. Unlike the road car, however, Aston Martin hasn’t released any images of the track-only Valkyrie so we have no idea what it looks like. That hasn’t stopped rendering artist Marco van Overbeeke from speculating, however, who has produced a render showing what an AMR Track Edition Valkyrie could potentially look like. Since Aston Martin’s track weapon will require more downforce, Overbeeke has fitted the Valkyrie with a more prominent front splitter and two canards on either side of the bumper. The hypercar’s carbon fiber fins have been modified, and a large shark fin has been added to increase the stability. Completing the design are racing wheels and Michelin slick tires. It also wears a custom racing livery inspired by some of Aston Martin’s iconic race cars like the vintage DBR1. The livery also features some of the manufacturers that helped develop the car including Rimac, Bosch, Alcon, and of course Red Bull which is shown in a special edition livery that highlights Aston Martin becoming a title sponsor of the Red Bull F1 team in 2018.